Brooklyn Boulders Somerville is redefining the open office concept. Wouldn't the workday be more fun if it occurred on top of a 22-foot-high climbing wall? Most people hate open offices. 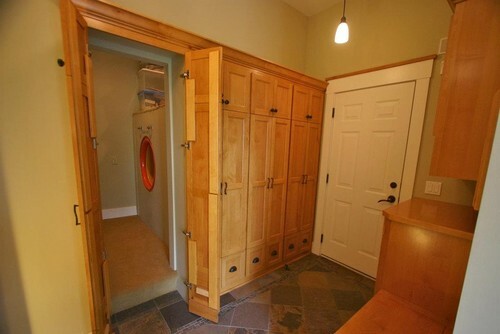 They're loud, people sneeze every minute, and there's barely any privacy. But what if your open office was a climbing gym and your coworkers constantly cheered in admiration at people scaling the walls in the background? At Brooklyn Boulders Somerville, a combination climbing gym and collaborative workspace in Somerville, Massachusetts, people do their work in the middle of utter chaos--and according to Jesse Levin, the facility's "Senior Cultural Chameleon" (he deals with everything that isn't related to rock-climbing), they love it. "When you're really in touch with your body physically, it affects every facet of your life. I never quite understood why there was such a segregation between your career and working and going to the gym and community interaction. It made a lot of sense to me to bring it all together." This belief in the mind-boosting power of physicality touches other areas of Levin's life as well--when he's not working at Brooklyn Boulders, he runs Tactivate, a program aimed at turning military special operations veterans into entrepreneurs (the general manager of the gym is a reserve officer in the Navy). Brooklyn Boulders Somerville just opened four months ago, but it's the sister facility to the original four-year-old Brooklyn Boulders gym (located in Brooklyn, obviously), which doesn't have a collaborative work component. The workspace, planted in the middle of a 40,000-square-foot climbing facility, is located on top of a 120-foot-long and 22-foot-high climbing wall. There's free Wi-Fi, a lounge area with couches, a communal table, a smattering of standing desks with built-in pull-up bars, seated desks with balance ball chairs, and a few quiet spaces. No special membership is necessary--any member of the climbing facility can work there for free. "It's like the sauna. It's a perk of the facility." He believes that one of the main benefits to using the co-working space is the proximity it gives to the kinds of people who would want to work in a climbing gym. Levin says. "Climbing inherently attracts venture capitalists, artists, programmers. It's a very cerebral sport, and they mix naturally. We're giving them a space where they can embody and live this lifestyle." The collaborative workspace has proven to be popular, in spite of the recent backlash against open workspaces. In addition to accommodating individual workers, the space has also played host to corporate meetings (companies like Puma and Vita-Coco) and a hackathon to develop fitness-related applications, which saw participants doing push-ups and taking turns on the climbing wall in between coding sessions. In 2014, the gym will host a TEDx event. It's hard to imagine using the gym as a primary workspace, but it's a worthy experiment at the very least. Levin says. "In no way shape or form is this your traditional sterile, polished workspace." COMMENTARY: Now that's what I call a truly fantastic co-working office space. It is definitely a cut above other co-working or virtual office spaces in the way it is designed to enhance the physical well-being, not just the financial (lower costs), productivity and intellectual well-being. It's a very big space, with a lot of open, non-revenue generating space, with high startup costs and high monthly fixed operating costs, so my biggest concern is whether the operators can make money off of such a facility. Having said this, it is my belief that in order to be competitive in the collaborative office space market, you must truly standout from the crowd, offer a lot more than just office space, and enhance the workspace experience beyond just a comfortable and productive place to work. Brooklyn Boulder Somerville has succeeded in doing all three. For some intrepid homeowners, their home is their playground. Bringing slides indoors is not common enough to call a trend that's sweeping the world, but we're starting to see it here and there, and the idea is spreading. 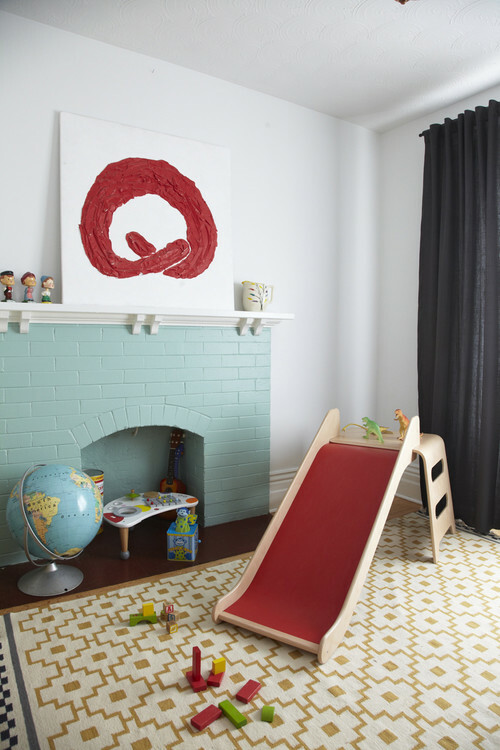 From taking center stage in swanky Manhattan penthouses to providing the fun secret way to get from the laundry room to the basement in Minnesota, these playground pieces are anything but child's play. This slide in New York City's East Village, originally in the pad of a bachelor professional poker player, received a ton of press online, in magazines and on TV. I saw it on one of those high-end real estate shows, and the slide's projected effect on resale value caused some entertaining manufactured-for-TV drama. When square footage is at a premium, taking up a lot of room with a slide is a very specific homeowner choice, but wow, it really dazzles, and I bet it gets the endorphins going if you slide downstairs to get the first coffee in the morning. The slide was conceived by the creative minds at Turett Collaborative Architects. 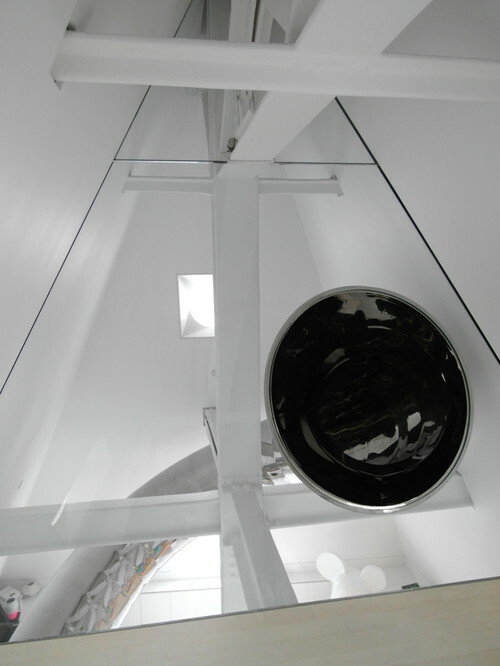 It connects an upstairs office to the middle of the open floor plan below; it's a half-tube design in stainless steel. However you feel about its function and the room it takes up, the slide certainly stands up to the 18-foot-high ceilings in the large, open space. This image shows what the apartment looked like after Joyce Elizabeth staged it for resale. 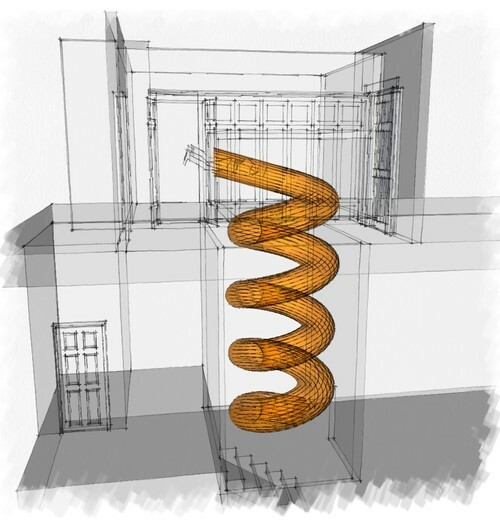 This slide is for recreation and art; its beautiful form is a huge presence in Skyhouse, an artful Manhattan penthouse, connecting the attic to the guest room hallway, then continuing down in a second leg to the living room below. This place is like something out of a movie, perhaps a remake of Sleeper. Inspired by German artist Carsten Höller, architect David Hotson's slide design has a futuristic form and serves as a sculpture in this unique space. 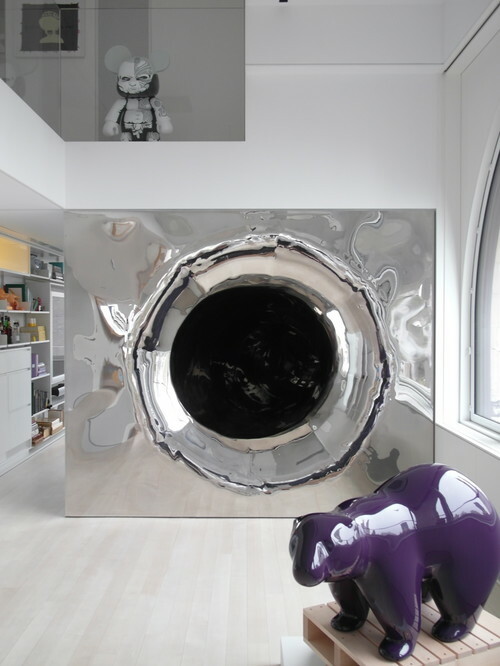 It was fabricated in Germany and put together onsite, before many of the walls inside the penthouse went up. The end of the slide makes a huge design impact and also serves as a work of art on its own. Houzz contributor John Hill put together a wonderful tour showing more of this one-of-a-kind home. Rather than serving as a sculpture or major design statement, some slides are surprises hidden in the walls. The basement rec-room fun begins with the trip down a level in this Minnesota home. This one's entry point is tucked away in a first-floor closet. The round opening does not give away what the slide experience will be, which builder Steve Kuhl describes as "severe tubular craziness." 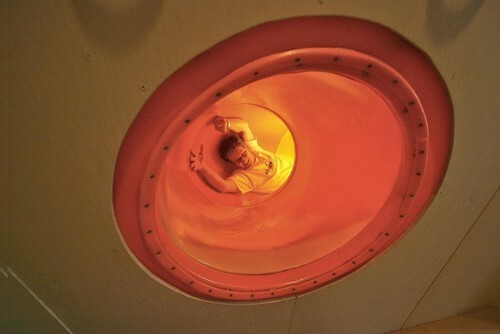 He estimates that installing a slide like this somewhere else would run from $2,500 to $5,000. For those of you considering head-first descents, be sure to have a soft landing spot at the bottom. Two New York City penthouses were combined into a single two-story unit, prompting the owner to request a slide connecting the two. How great is that? I've seen people put fire poles in their homes, too. 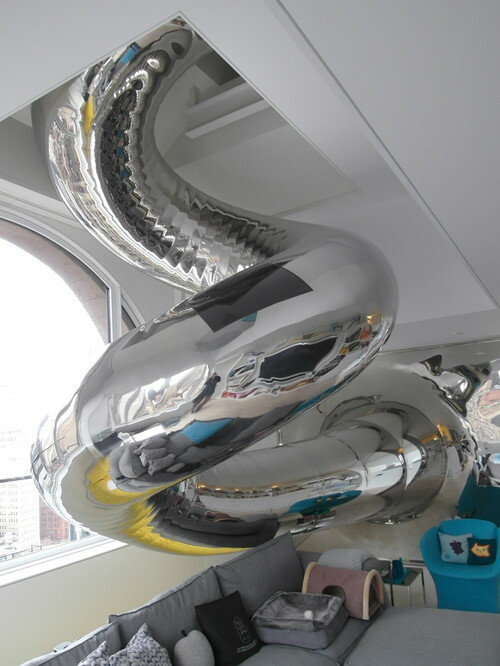 COMMENTARY: Adding stainless steel tubes or half-tubes to slide from an upper floor to a lower floor is the coolest idea I have seen in quite a while. Kudos to the architects and interior designers who incorporated slides into the interior design of their houses and apartments. The slides definitely takeup a lot of room, and I would be concerned that very small children might use them, so parents will need to take extra precautions to prevent terrible accidents from occurring. Having said this, if you have a very large home or apartment with two or more floors, and can afford the cost of adding stainless steel slides, go for it. It is obvious that if you are going to hire an interior designer to add slides to your home, that you have already decided to make the necessary financial investment for such an endeavor. When talking about workplace design, the buzzword “collaboration” flies around the tech world faster than a speeding foosball. From startups working out of garages to sprawling corporate campuses, everyone is looking to harness the creative energy of people working together. Pinterest is no exception. The design-driven company is using its new 45,000-square-foot headquarters in San Francisco’s SoMA neighborhood as a test site for collaboration. Employees moved into the space in April, filling a brick warehouse on 7th Street that had been stripped down to basics: large industrial windows, wood beams, steel structure. But into that raw space, concept designers Janette Kim, of All of the Above, and Anna Neimark and Andrew Atwood, from First Office, along with executive architect Neal Schwartz, inserted a grid of four white volumes. Each 20-by-20-foot cube-like “house” functions as a different kind of meeting, working, or gathering area. Almost totemic, these architectural interventions answer the challenge of how to have 150+ people working in an open-floor plan and still have places for quiet, creative intensity--and yes, collaboration. Pinterest co-founder Evan Sharp explained. That doesn’t mean that emphasis is placed solely on efficiency or productivity. Like literal houses, the hubs within the office are meant to foster community. But perhaps, in the spirit of Pinterest, they are more like fun houses, with something a little strange or unique in each one to bond people together. For instance, an oversized circular table is intentionally too big for a single meeting or group lunch. Kim explains. By contrast, the “war room” is designed for power-working sessions on deadline. Desks allow designers and engineers to work shoulder-to-shoulder on their laptops and then feverishly cover the whiteboard and glass walls with their brainstorming notes. The conversation of how to work collaboratively began for Kim long before she sketched a plan. Sharp was her student in 2008, when he was a graduate student studying architecture at Columbia University in New York City. Kim and Sharp remained in touch after he founded Pinterest in a garage and would discuss the connections between architecture, startup culture, and information design, contemplating how meaning is generated for spaces, objects, and photographs. Recalls Kim. That dynamic culture expresses itself in the architecture and in the ever-changing displays of vintage signage and funky objects brought in by the staff. DIY art projects made by crafty “Pinployees” hang from the rafters, evidence of after-hours creativity. COMMENTARY: I have always preferred the simplicity of open space plans over the confinement of office cubicles. Pinterest's new headquarters are quite typical of today's high technology startups: fast growing, team-oriented, highly social, creative and innovative. You almost have to do away with the cubicles in favor of just a few private places where peope can gather for collaborative brainstorming and private meetings. It means less investment in office furniture and sacrificing some privacy, in favor of clear lines of communication and social interaction and collaboration. When done properly, the architecture and interior space plan can, as in the case of Pinterest, appear very impressive and appealing to the eye. I love the interior space plan concept of the "four houses," because the office spaces are purposely designed to foster a sense of community and belonging. Pinterest's HQ is probably a very noisey place, especially the lunch room area. It gives one the feeling of a community, a corporate family, if you will. Everything is out in the "open." Even the conference rooms have glass walls, so there is no attempt to hide anything. I didn't see any curtains, so I wonder how they handle confidential information. Just the same, Pinterest's new HQ came out quite impressive. Fun. Friendly. Inspiring. Collaborative. Productive. If you wouldn't define your workplace with any or all of those terms, you may have to ditch your own desk and take a seat at a coworking space near you. Even if you aren’t an entrepreneur or freelancer, the benefits of coworking, according to Deskmag’s annual Global Coworking Survey, are pretty hard to ignore: 71 percent of participants reported a boost in creativity since joining a coworking space, while 62 percent said their standard of work had improved. The study also found that half of all coworkers access their work space around the clock--with only 30 percent preferring to work during normal business hours. Regus CEO Mark Dixon tells Fast Company. Dixon notes that coworking allows for businesses to test new markets relatively risk-free. Dixon explains. For example, Regus plays host to real estate agencies that ironically don’t have their own real estate. Instead, they give all the agents cards to check into a nearby coworking center when they need to print materials or get paperwork done. Dodd Caldwell, founder of Loft Resumes and MoonClerk, has been coworking for two and a half years in Greenville, S.C. Most recently, he’s sharing space with other startups at Iron Yard. Caldwell say. One of the main advantages to coworking, Caldwell says, is the ease of collaborating with other companies sharing the space, many of which don’t have more than three people. The challenge, according to Hinson, will be to keep proprietary projects a secret. But he’s not overly concerned. he says. In addition, the facility has security controls such as thumbprint readers and secure Internet access. If need be, says Hinson, they can wipe all data from computer terminals every time someone new sits down to use it. Dixon believes that the flexibility to “work your way” is leading to greater productivity and job satisfaction. He points out a recent survey conducted by MindMetre in which 64 percent of U.S. employees are happier with their jobs today than they were two years ago because of the increased flexibility and shift towards a clearer work/life balance. Dixon adds. COMMENTARY: Coworking or shared office facilities really began to take root during the Great Reession which began in 2007, when many companies were forced to downsize by laying-off workers and reducing office space in order to reduce their operating expenses. As a result, millions of square feet of office, retail and manufacturing space became available, and rents dropped dramatically. Many commercial real estate brokers and developers were forced to rent out their surplus space to individuals and companies on an as needed basis. The effects of the Great Recession, the internet, social media and need for collaboration has created a huge pool of mobile workers who either work out of their home or work in coworking or shared office facilities as the need arises. Today hundreds of coworking or shared office faclities rent out office, retail and even manufacturing space on an hourly, daily, weekly or monthly basis to meet the needs of corporations and the mobile workforce. Elimination of fixed monthly lease rent. Ability to pay for space on an as needed and affordable basis. Shared office facilities are available just about everywhere now, even at airports, convention facilities and hotels. Elimination of facilities costs (utilities, janitorial, insurance, security, maintennce and repairs, phone, fax, copier and miscellaneous supplies). A professional facility for conducting staff and client meetings and collaborative efforts. Provides a place for direct social interaction between broadly dispersed workers. If you believe your company could benefit from coworking or shared office space, conduct a feasibility study comparing the pro's ad con's and differences in costs between a shared office space and a lease. If you are a startup, I highly recommend that you maintain a mobile workforce and only rent space on an as needed basis. If you have a longterm lease, it may often be advantageous to sublease the space to a third party (if the lease allows subleasing), and rent coworking or shared office space on an as neede basis, thus eliminating a lot of needless overhead in the process. This gives workers an opportunity to interact directly, collaborate and share ideas.